Whether you want a custom entryway for your private residence or business, you can trust Stromberg to create a quality entryway that suits your style of living. For those who demand excellence, a Stromberg custom entryway in glass fiber reinforced concrete (GFRC), is the way to go. Stromberg can replicate a look for you or design something refreshingly different. The entryway that Stromberg will customize for you will be uniquely suited to your style and taste; and GFRC is an excellent choice of material. Whatever color, finish or texture you want, Stromberg will help you choose just the right one for your project. They’ll put their 30 years of experience with GFRC to work for you, as they have for countless other clients. 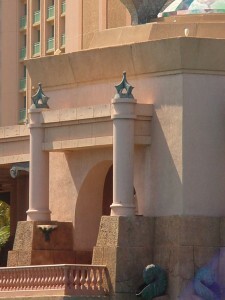 Stromberg has crafted custom entryways for the hospitality industry, government buildings, churches and private homes. Glass fiber reinforced concrete is a superior choice; it’s reinforced with fiberglass making it much lighter and easier to work with than pre-cast concrete. Installation will be quick and easy and transport will cost less. If your custom entryway is large, GFRC is your best choice. The glass fibers in GFRC won’t rust like the steel fibers in pre-cast concrete, so a protective concrete covering for your entryway won’t be necessary. Stromberg pioneered the use of glass fiber reinforced concrete and they’re experts in its application; they deal in quality. A combination of cement, glass fibers, aggregates and polymers, GFRC is durable, weather resistant, attractive and even fire retardant. Your custom entryway in GFRC will stand up to weather conditions like moisture and salt air; Stromberg has even made custom entryways for businesses in earthquake prone areas, and they can create a custom entryway for you that will be perfect for school, home or office. GFRC is virtually maintenance free. GFRC entryways are available in a wide variety of designs and styles. Glass fiber reinforced concrete can be made to look like natural stone. Completely original custom designs are obtainable from Stromberg. The professionals at Stromberg Architectural Products are dedicated to seeing your entryway project through to completion. They want to make sure your dream is realized and they offer you help with CAD details, design assistance and all specifications. Contact them today at (903) 454-0904 for a free custom quote, or email them.